One has to admire Manilla Road's stamina. Since their first demo in 1979, the legendary Kansas epic heavy metal band hasn't slowed down at all in their output other than during that sad period in the 90s when they first split up, then reformed and stuck to local shows for a while. Their last album, while more progressive and perhaps more dense than usual, was just as heavy and riff-filled as earlier efforts, so I was looking forward to see what direction they were going to take their latest. We need wait no longer: Mysterium, their latest, is just as heavy, still dense, but revisits some epic material. Though it may not have been intended to be structured this way, I'd almost call this a concept album, beginning with songs of war, filled with doomed last stands and fundamental changes in the air, and ending in outward exploration. With the first few bars of The Grey God Passes, it's clear this isn't going to be any smoother or more easily digestible than Playground of the Damned was. Mark Shelton's rhythm riffs and solo leads are just as rich and complex as ever, and both the guitars and vocals are abrasive -- the guitars because of the buzz-saw overdrive used, and the vocals...well, if the vocals weren't limited in range and sung through the nose, it wouldn't be a Manilla Road album. Most of the material, with the exception of The Fountain and The Calling, are drenched in heaviness -- the drums (Josh Castillo) and bass (Andreas Neuderth) are larger than life and get equal treatment with the guitars. There are some enjoyable little surprises in the song list. The Battle of Bonchester Bridge started quiet and I had the idea that maybe Shelton had decided to quiet down the music a bit (his ringing, partially overdriven guitar has a good quality when played quietly), but this proved to be the calm before a storm of squealing harmonics followed by a long solo. The Fountain is actually a folk-style ballad about exploration, where the object of one's desire is just over the horizon, and Do What Thou Wilt even has a reference in the lyrics to another concept album: The Moody Blues' Search for the Lost Chord, to go with a ragged-edged, doomy riff in the style of Marcolin-era Candlemass. The Calling, a soft instrumental consisting almost solely of synthesized elements -- almost the equivalent of a soundtrack, if you will -- is a nice break from the heaviness, too. There are a few nagging problems that keep resurfacing. Rhythm riffs get repeated -- the verse riffs of The Old Hermitage, The Grey God Passes, and Hallowed Be Thy Grave are too closely related for comfort -- and some of the choruses (the ones on Hallowed Be Thy Grave and Do What Thou Will, for instance) sound somewhat insipid, especially when compared to past material. 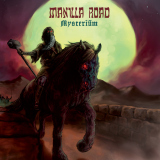 But the final track, Mysterium, is a 12-and-a-half-minute monster that gives us some real epic metal to chew on. There's a lot of light and dark in this one; the dissonant melodies and dreamy but ominous clean picking with younger co-singer Bryan Patrick's vocals, transitioning to metal riffs with Shelton's vocals, sound great, and it feels like Shelton took a lot more time on this one than on some of the other tracks on the album. Overall, this is a good album with some small flaws, most of which can be ignored. It's never going to beat Crystal Logic, but it's solid and enjoyable to listen to all the way to the the last track.